I guess three seasons is the charm. Today, HBO cancelled its smart and continually underrated comedy series “Bored to Death.” The announcement was not followed by outrage or backlash but simply, a series of copied press releases. Unlike other shows that have struggled in the ratings in the past (“Arrested Development,” “30 Rock,” “Community”), “Bored to Death” never gained a loyal following. Viewers were few but those who watched it knew it was smarter and funnier than most of the shows they were used to. Unlike the other shows previously mentioned, “Bored to Death” has just as many, if not more, detractors as it has followers. One piece of criticism on the show that struck me most was a column publish for Entertainment Weekly’s website, in which writer Darren Franich said he felt exactly the feeling described by the title every time he watched an episode. Now there’s a joke even Jay Leno wouldn’t put into his opening monologue. What bothered me more than that joke was an accusation made by the author, which was repeated by many in the comments, that a show with a Brooklyn-centric appeal doesn’t belong on television. Why is it that the only base that writers, directors, and producers alike have to appeal to is “Middle America”? Maybe it is because Middle America is apparently into so-called mindless entertainment, and they makes up the majority of America. However, television has changed drastically in the past few years. Shows like “Breaking Bad” and “Boardwalk Empire” are more talked about than the “CSI” franchise, and while “Two and a Half Men” still dominates the ratings, a show with a twisted narrative like “How I Met Your Mother” can now occupy the classic sitcom format. Thanks to specialized cable networks, audiences have become more specialized than ever before, and niche shows can now survive and thrive alongside shows with mass appeal. HBO is certainly justified in its cancellation, as the show never pulled in ratings, and it wrongfully never garnered a single Emmy nomination. But HBO is known for edgy programming, and it is a shame that they never gave “Bored to Death” the chance that it deserved. With a little bit of effort, this show could have had much wider appeal. So what if it takes place in Brooklyn? So what if a majority of its jokes center around Jewish neuroticism? “Curb Your Enthusiasm” targets basically the exact audience, and it has been running strong for eight seasons. “Bored to Death” is not just inhabited in the world of hipsters, but it is also an inside satire of sorts of that culture which anyone who has ever been to a big city or a modern college campus can appreciate. “Bored to Death” is also first and foremost a detective story, and each mystery is as surprising as it is entertaining. This show also pulls off the rare balancing act of having a season full of self-contained episodes that also fit in to a larger plot. Despite running on the exact same formula, each and every episode still feels refreshing and original. I would wager that a value of Middle America is familiarity, and any show with a consistent formula is usually able to build a loyal following. The Jews may run Hollywood (according to Professor Mel Gibson M.D. ), but making them the center of any story will apparently make most of the country want to change the channel. 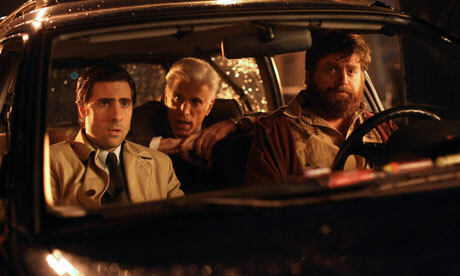 “Bored to Death” did have some limitations in its stories, as it involves something of a literature and pop culture prowess to enjoy, but most of its humor was so madcap that anyone could have laughed at it. One of the gags that first got me into “Bored to Death” was in the second episode of the series when Ray (Zach Galifianakis) randomly falls on top of a baby stroller. In a later episode, he spills iced coffee all over another baby. Franich writes in his article that he thought the only growth that Danson’s George did was in the amount of pot smoking he does. First off, that element of the show has always been hilarious, as his habits once lead him to tamper a drug test by adding soap to a urine sample. But really, Danson grew into the character whether it was through his relationship to his daughter in the most recent season, or his brave decision to leave his job as magazine editor. Galifianakis was also more than just a prop for slapstick, and he showed more dramatic range in this role than he ever has during any other point in his career. Thanks to Jonathan Ames, “Bored to Death” had some of the highest quality writing on television. Each season was better than the last. 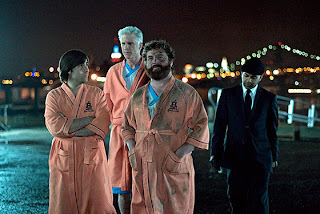 Some highlights have included a diner scene in season two that felt reminiscent of the finale of “Pulp Fiction” in the best way possible, and an episode where Jonathan (Jason Schwartzman), Ray, and George have a wild night in New Jersey that ends with them rear-ending a cop car. There was something habitually funny about the show’s writing and performances. Each of its three seasons were only eight episodes in length, or about one third shorter than the length of the average TV comedy series. The best part about this was that it allowed Ames to put an extra amount of focus and detail into every episode, as opposed to other shows where the writers have to create episodes like an assembly line. It is no wonder that each episode of “Bored to Death” felt like a serial in a larger novel series and not just a half hour television episode. I know out there somewhere, there is a compassionate cult of “Bored to Death” fans who have yet to come together and express their outrage. This Hipster Noir of a comedy will eventually earn its place among the pantheon of great shows that were cancelled too early. Until that day comes, I say #OccupyBoredtoDeath all the way. This entry was posted in Bored to Death, Brooklyn, Cancelled, Comedy, HBO, Hipsters, Jason Schwartzman, Jews, Middle America, Mystery, Quality TV, Ratings, Ted Danson, Zach Galifianakis on December 21, 2011 by ian0592.